A primary source of storing data at the time was “punching” the information onto cards. 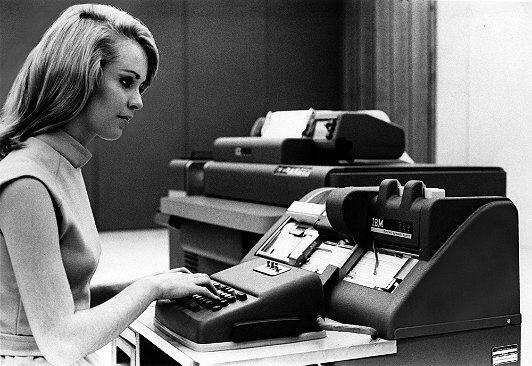 This was considered clerical work, and a keypunching operator position was a common job for women in the 1960s. Here a woman is shown punching data onto cards. For more photos and details on the evolution of the punch card and the people who worked these computers see the The Punch Card’s Pedigree page. Advancements in technology during this time helped make things such as air travel more efficient. SABRE, one of the most widely publicized and influential computerized reservation systems, was co-produced by American Airlines and IBM. 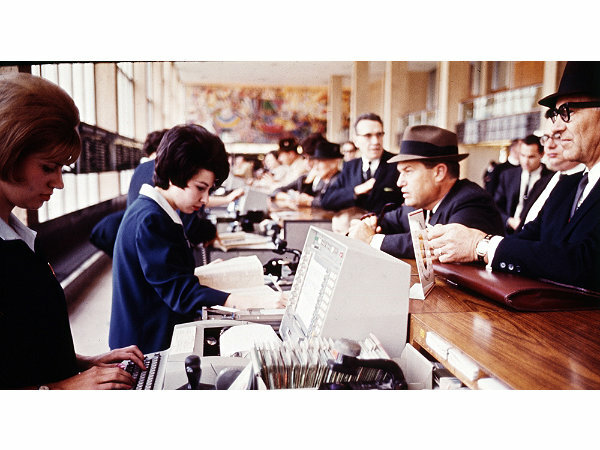 It was used starting in 1964, and it was often operated by women as shown in the picture below. To read more about SABRE and its role as technology, see the Mainframes in Daily Life page. Women operating SABRE. Photo courtesy of IBM Corporate Archive, circa 1964. Programming for new computers was a slow and tedious process. This was aided by tools such as the flowchart template seen below, which helped make writing a large program simpler. The image below shows an IBM programmer mapping out instructions using the flowchart template to display a logical flow of the program. For more information about the progression of programming in time, see this Higher Level Languages page. 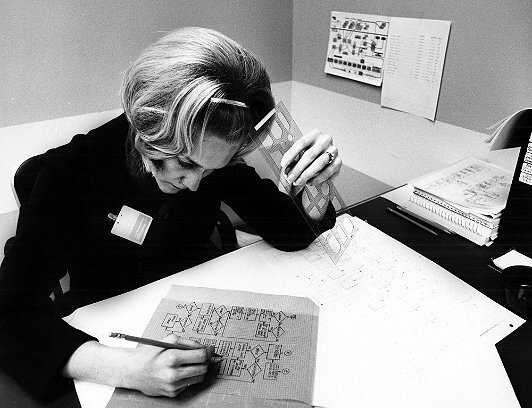 Photo courtesy of IBM Corporate Archive, circa 1965. 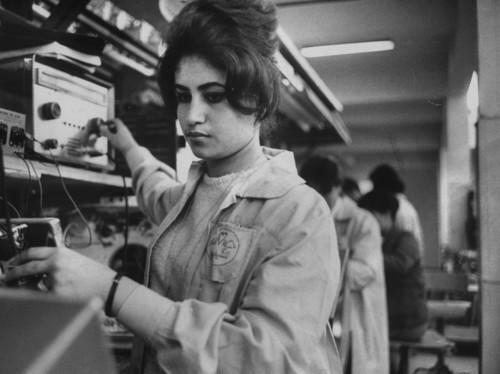 Women around the world were involved with technology: the picture below shows a woman working at TeleMisr, an Egyptian state owned television set manufacturing plant. In this plant, nearly half of the six hundred employees were women. To find out more about labor culture and history through time, see the Rutgers University library page for an index of sources. The role of the female typist, sometimes called a “girl operator” in technology was seen as clerical work and not a part of the “higher” thinking jobs in tech. Here these advertisements depict the computers as being simple enough for a mundane person to use by showcasing a typist as the main user. 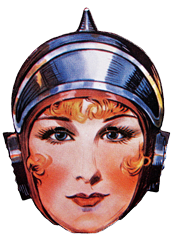 Although women in these roles usually did much more than secretarial work, and were mostly immersed in the technology that they used, they were not recognized for being technologically literate. They were most likely stuck in the preconceived notions of basic clerical work. For more on the history of women in computing in Britain between 1950-1970, see Marie Hicks’ blog. 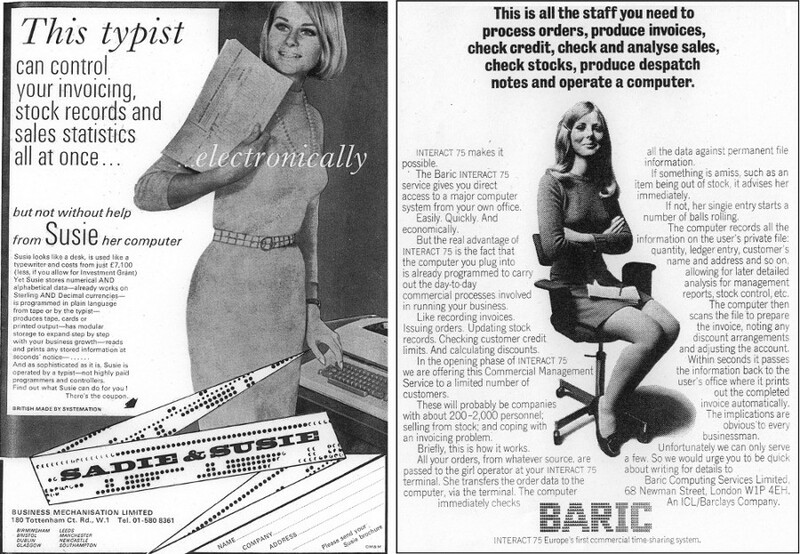 From left to right: An advertisement for the “Susie” machine and an advertisement for the Baric (circa 1967). Photo courtesy of Marie Hicks blog.